↑ 1.0 1.1 1.2 1.3 "Hubble Essentials: Quick Facts". HubbleSite.org. जुलाई 6, 2016 के ओरिजनल से पुरालेखित. ↑ Ryba, Jeanne. "STS-31". NASA. ओरिजनल से मई 7, 2017 के पुरालेखित. पहुँचतिथी मई 7, 2017. 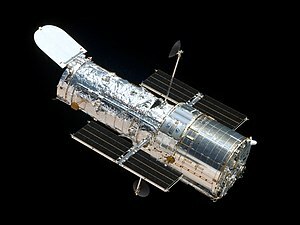 ↑ "Hubble Space Telescope – Orbit". Heavens Above. अगस्त 15, 2018. पहुँचतिथी अगस्त 16, 2018. ↑ 5.0 5.1 5.2 Nelson, Buddy; आ अन्य. (2009). "Hubble Space Telescope: Servicing Mission 4 Media Reference Guide" (PDF). NASA/Lockheed Martin. प. 1-5.